With a recipe for the perfect vinaigrette. Two of my house standards, laid side by side in our cartooned gift box. And for the cook who’s ready to branch out beyond bottled salad dressing, my classic foolproof vinaigrette recipe. 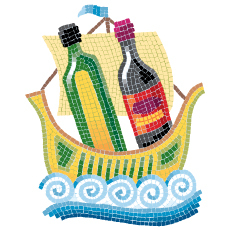 Zingerman’s Peranzana extra-virgin olive oil from Marina Colonna is rustic and fruity, with an apple-y aroma and a finish with a whisper of almond. Rioja red wine vinegar from Spain is naturally converted, barrel aged for four years and has mellow, deep flavors of raspberries and red grapes. Independent of each other, they have a hundred uses in the kitchen. Bound together in a vinaigrette, they make salads and just-cooked vegetables outstanding.